The march of Caterpillar's lay offs continue as 330 workers learned on Saturday that the company's tunnel-boring machine factory in Ontario will be closing. Caterpillar (NYSE:CAT) bought the plant in 2008 from Lovat Inc., a global manufacturer of tunnel boring machines used in the construction of metros, roads, railways and sewer systems. Caterpillar said it was exiting the business since it no longer viewed its services as having "strategic growth." The tunnel boring equipment was used in a number of large projects, including expanding Britain's underground tube system. The company is located outside Toronto. Last month the Caterpillar said profits had dropped 45% and forecast ongoing weakness in both its mining and construction segments. The company said layoffs were planned. In April the company cut 40% of its South Milwaukee factory workers and 460 workers at its Decatur, Illinois factory. 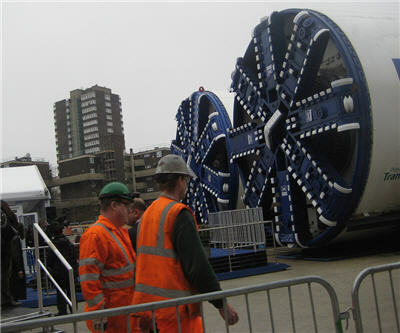 Image by Annie Mole of tunnel boring machinery about to begin work on the London Underground.